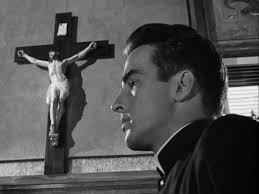 Montgomery Clift stars as Father Michael Logan, a Canadian Catholic priest serving in Quebec. But his routine life takes a turn when the sacristan, Otto Keller, confesses to having murdered a prominent businessman, Monsieur Villette, and Logan is sworn to secrecy under the Seal of Confession. He tries to convince the Keller to turn himself over the authorities, but instead the penitent sets out to frame the priest as the real killer. Meanwhile, Ruth Grandfort, the beautiful wife of a prominent Canadian lawyer, sets out to clear Fr. Logan by exposing a complex web of rumor, scandal, and blackmail that connects them both with the murdered Villette. But by bringing old secrets and new struggles to light, she only adds to the mounting suspicions that Logan was carrying on a romantic affair with her, and that he did indeed have a motive to silence Villette. As the net closes, Logan must make a decision whether to flee the city and the false accusations or turn himself over to the police to be tried for murder. Even though he knows all the evidence is pointing against him and he has little hope of acquittal unless he reveals what he heard in Confession, he will not disgrace his priesthood by running away, and decides to stay and face his fate head-on. Once he is brought to trial, the prosecution relies heavily on the emotionally distraught testimony of lovelorn Ruth and the blood-stained cassock found among Logan’s possessions. In a twist of irony, Otto Keller, the real murderer, is also brought forward to testify against the priest. Now Fr. Logan must wrestle with the decision whether to seize his last chance to save his own life before it is too late, or to abide by the Seal of Confession. This movie is one of those vintage gems that leaves one speechless by the sheer impact of the story and artful depiction of the setting. The black-and-white scenes filmed on location in old Quebec are deliciously dark and foreboding, and there are some glorious scenes of church interiors with soaring altars that seem to speak of hope in the midst of desolation. All this combines to create a seamless movement from one mood to another. There are also a lot of typical “Hitchcockian” bits involving doing weird things with dinnerware (like trying to balance a penny between two forks or a glass of water on one’s chin) and his trade-mark “walk-ons” as a parishioner coming out of church and a pedestrian meandering down a dark alleyway. There are also loads of suspenseful, dialogue-driven encounters and a big chase sequence with a lot of shooting. As I said, that’s Hitchcock. Thanks to an excellent cast, the intensity of the characters wrestling with their inner demons is palpable. Montgomery Clift portrays Fr. Logan in a deeply human way, yet makes his devotion to his priesthood the keystone of his character. There are any number of really engrossing sequences in this film dealing with Logan’s inner turmoil and the battle that rages within him between his identity as a priest and a man, comparing his own crosses to the Cross of Christ. The scene where he walks through Quebec, uncertain whether to run away or stay to face an unfair trial, is paralleled by the beautiful life-sized Stations of the Cross he walks past in the park. His anguished journey finally draws him back inside a church, his eyes uplifted towards the altar, before finally turning himself over to authorities. Again, in the court itself, there is a shot of Logan sitting in the interrogation box, which fades out on the face of the priest and brings into focus the crucifix hanging on the wall behind him, reminding the viewer of Christ’s own unjust trial and punishment. One burning question remains: Is Anne Baxter always doomed to be type-cast as a somewhat pathetic, generally annoying former flame, fading enchantress, trying to reclaim the affections of her ex-boyfriend at his expense? After a while, it gets nothing short of monotonous knowing exactly what sort of character she is bound to be! That having been said, I think she grew sufficiently comfortable with these parts to pull them off quite well. As Ruth Grandfort, she effectively makes you want to shout, “Shut up!” when she starts spilling her past indiscriminately and making things worse and worse for her Logan who she just won’t give up, even though he has clearly given her up for his calling to the priesthood. Happily, he is much more understanding towards her than Moses was in The Ten Commandments! O.E. Hass and Dolly Haas also do an excellent job as Otto and Alma Keller. The way Otto verbally pins Fr. Logan into a corner, testing him to see if he will reveal what was said in Confession, and taunting him with the fact that he is framing him for the murder, is so blood-boiling, heightened by the look of disbelief and horror on Montgomery Clift’s face. Alma is also a wonderfully complex character, caught between her loyalty to her husband and her own guilt for helping to destroy the priest who has been so kind to them as immigrants. In the end, she will choose to do the right thing, saving Fr. Logan by sacrificing herself. Interestingly, I Confess was initially not very well received because non-Catholic viewers had a hard time understanding the rationale behind The Seal of Confession and why it would so noble, instead of just stupid, for a priest to conceal the identity of the murderer. That is why the very sparse “romance” element in the film is often played up to the hilt, with movie covers displaying smooching sequences that never, ever occurred! There was also a move to exploit the murder mystery angle, introducing smothering sequences on the cover that also never, ever occurred! In spite of hang-ups in the non-Catholic world, the undeniable quality of I Confess caused it to come into its own in later years, and it has come to be accepted as an excellent example of suspense cinema, complete with unusual conundrum and powerful resolution. For me, the most poignant scene of all has to be the conclusion in which Fr. Logan once again gives absolution to his tormenter, Otto Keller, after Keller is mortally wounded. The first time I watched this, my jaw just hung open for a long time, and I knew I would have to watch it again before long. For once agreeing with the general consensus of critics, I would definitely rate this intricate study of human weakness and strength as the best film the Master of Suspense ever directed or produced. Avellina Balestri (aka Rosaria Marie) is one of the founding members and the Editor-in-Chief of The Fellowship of the King, a Catholic literary magazine featuring the works of homeschool students, homeschool graduates, and beyond. She reads and writes extensively about the history and culture of the British Isles, taking a special interest in the legends of Robin Hood and the stories of the Catholic English Martyrs. She also sings, composes, and plays the penny whistle and bodhran drum, drawing inspiration from Celtic music artists such as Loreena McKennitt. She also spends her time watching and reviewing classic movies, networking with a host of zany international contacts, and last but certainly not least, striving to deepen her relationship with the Ultimate Love and Source of Creativity, and share that love and creativity with others.